He said a priority for the two sides’ work in the next phase is to comprehensively implement the consensus between him and Russian President Vladimir Putin on practical cooperation between the two sides. Though light on details, the message is clear: Russia and China stand together. When convenient, the linking of the BRI and the EAEU is mentioned by Russian and Chinese leaders. It generates in the mind the image of two global giants hitching together their prized economic projects. In the subsequent years, however, here hasn’t been much clarity on what either side really means when they mention this connection. In the meantime, the BRI remains as amorphous as ever — anything can be a BRI project if the Chinese say it’s a BRI project. The EAEU, in contrast, putters along, inspiring neither confidence nor much increased economic activity. The EAEU as a prestige-generating project for Russia has fallen relatively flat. A further two years on, tangible progress still remains largely locked in rhetoric. In May 2018, a Sino-EAEU agreement was signed with the expectation that it will enter into force in early 2019. As Gregory Shtraks noted in an analysis for the Jamestown Foundation, a Xinhua report cited the chairman of the board to the Eurasian Economic Commission, Tigran Sargsyan, saying that the treaty “creates a serious legal framework for the interaction of businesses and makes the environment in which they will operate predictable.” What that specifically means remains unclear. Arguably the entire point of touting the linkage of the BRI and the EAEU has been political. Nargis Kassenova, a senior fellow at Harvard University’s Davis Center for Russian and Eurasian Studies, argued as much in a recent piece for the Foreign Policy Research Institute. In March 2017, she notes, “the Eurasian Economic Commission prepared a list of 39 priority projects to support the linkage, including building new roads, modernizing existing ones, creating logistics centers, and developing transport hubs.” The list was not made public but among the projects cited by officials as on the list — the Western Europe-Western China motorway, Moscow-Kazan high-speed railway, and China-Kyrgyzstan-Uzbekistan railway — Kassenova writes, progress is slow and EAEU involvement questionable. “Such shallow progress in linking the EAEU and BRI indicates that its function is mostly rhetorical, signaling the intention of Russia and China to accommodate each other’s ambitions in Central Asia,” Kassenova writes. Central Asian states, certainly aware of the risks of dealing bilaterally with China, see few other options. Russia can’t provide the economic development support they require, and China can. 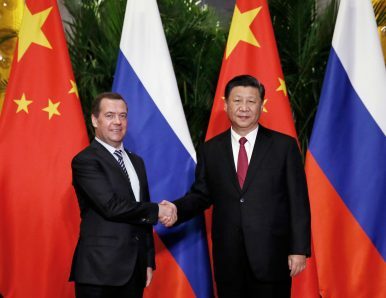 Beijing and Moscow will continue to tout the connection of the BRI and the EAEU for the simple reason that doing so satisfies the political needs of both sides.